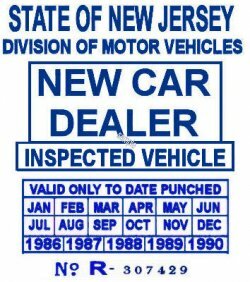 00 New Jersey New Car Dealer sticker 1986-1990 - $20.00 : Bob Hoyts Classic Inspection Stickers, Add a Final Touch to your Restoration! This sticker is 2 1/2 inches on each side and was introduced in 1986 but continued unchanged thro 1990. It was attached to the inside window of New Cars at the dealership. You own QQ License plate number can be ordered for this sticker in place of the random serial number for an additional $10.